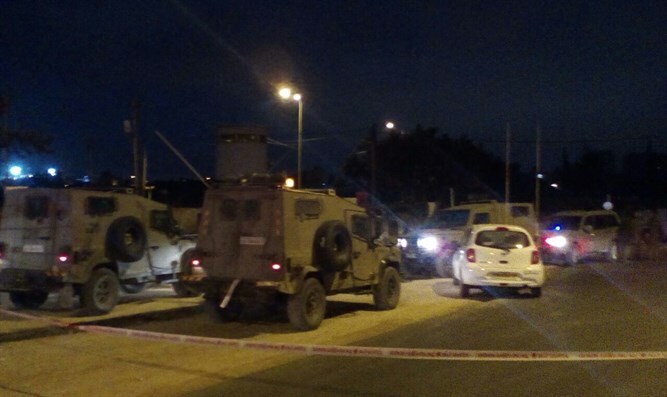 Three IDF soldiers were injured from shooting at the checkpoint to the entrance of Ramallah. The terrorist was neutralized and killed. A terrorist opened fire this evening at IDF forces at the checkpoint to the entrance of Ramallah, near the Jewish community of Beit El. Three soldiers were injured, one seriously and two moderately. MDA and IDF medics treated them at the scene and evacuated them to the hospital in Jerusalem. According to Palestinian media, the terrorist was a Palestinian policeman from the area of Jenin. MDA paramedic David Dalfan, a first responder at the scene, said: "When we arrived at the scene, we spotted a fully conscious 20 year old suffering from a gunshot wound to his lower extremities. Along with an IDF medical force, we provided initial medical treatment and proceeded to evacuate him to hospital in severe condition. Two additional 20-year-olds sustained light injuries to their limbs due to ricochet caused by the fire. They received initial treatment in the field and were later evacuated to Hadassah Ein Kerem hospital." Shai Elon of the Beit El Council told Arutz Sheva, "[Defense Minister] Liberman's program isn't working [...] In order to stop the terror we have to send a clear message that there is no room for 'two states for two peoples' in Judea and Samaria. It's time for sovereignty over Judea and Samaria."